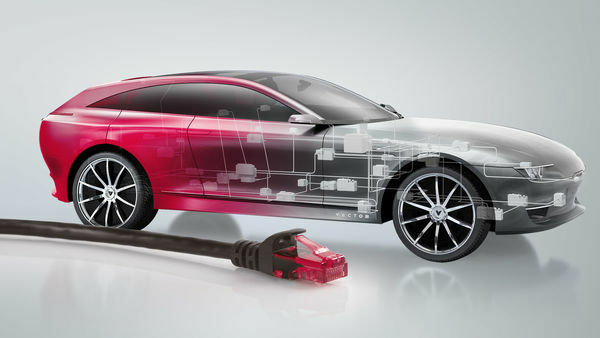 Ethernet technology is used for in-vehicle communication, measurement and calibration, diagnostics via DoIP and communication between electric vehicles and charging stations. Further drivers for in-vehicle Ethernet are the upcoming ADAS functions for automated and autonomous driving as well as infotainment use cases. Ethernet is also used as a data backbone, connecting the different communication domains of an E/E architecture. Vehicle manufacturers and suppliers are faced with a wide range of challenges, e.g. introduction of service-oriented communication. Security aspects also play an important role. Vector supports you with all kinds of professional tools, basic software, trainings and services. The Vector Ethernet toolchain helps to simplify the design, implementation and test of todays in-vehicle distributed systems utilizing Ethernet. PREEvision supports the AUTOSAR compliant design of Ethernet networks and clusters including the corresponding communication. The model-based engineering environment also enables service-oriented architectures for embedded software systems. In addition to many other modules, MICROSAR - Vector's AUTOSAR basic software - also includes modules for Ethernet-based communication in vehicles. These modules let you develop your ECUs efficiently and reliably. Drivers are available for many different Ethernet controllers, transceivers and switches. This enables the implementation of AVB end points as well as bridge functionality. DaVinci Configurator Pro is the central tool for configuring, validating and generating the basic software (BSW) and the run-time environment (RTE) of an AUTOSAR ECU. You can use this tool for MICROSAR modules from Vector as well as for your own BSW. The Vector Controllers in the automotive product family have been conceptua lized for use in 12 V electrical systems. Starting with gateways and extending to domain controllers, the product family lends itself to a broad spectrum of potential use cases. The VC36B-12 is a high performance automotive Ethernet switch. With five 100BASE-T1, a 100BASE-TX channel, 3 CAN / CAN FD channels and 1 LIN master channel it is well-suited for many gateway applications and backbone architectures. It is also appropriate as information highway and driver assistance (ADAS) controller in the automobile. The universal ECU VC121-12 offers many communication interfaces for CAN, LIN, FlexRay and Ethernet as well as IO interfaces. Therefore it is ideally suited as gateway ECU. 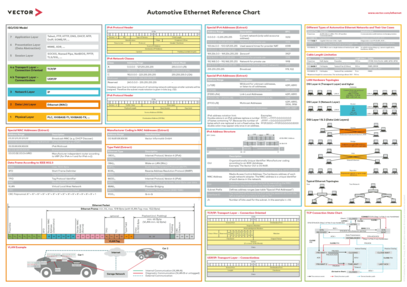 Automotive Ethernet is a switched network compared to the bus systems used in the automotive field. Special approaches for analyzing and testing networks are required. They include access to the network as well as the capturing of the entire communication. Analysis of the whole vehicle communication across bus and protocol boundaries. The option .Ethernet comprises protocols like SOME/IP, AVB/TSN, DoIP and more as well as the network technology Ethernet. Remaining bus simulation across networks and testing of ECUs and entire networks with one tool. The option .Ethernet comprises protocols like SOME/IP, AVB/TSN, DoIP and more as well as the network technology Ethernet. The VN5610A and VN5640 are compact and very powerful interfaces connected to PCs by means of USB. They provide an easy and transparent access to Automotive Ethernet and CAN (FD) networks. The use cases are switching, tapping and media conversion. The following products from Vector let users reprogram, measure and calibrate individual ECUs via Ethernet (e.g. 100BASE-T1). Measuring, calibrating and flashing over XCP or microcontroller-specific data trace and debug ports. CANape and VX1000 enable maximum transmission rates with minimal or no impact on ECU run-time. The VN5610A and VN5640 are compact and very powerful interfaces with USB host connection for accessing Automotive Ethernet and CAN (FD) networks. AUTOSAR basic software modules for reprogramming, measuring and calibrating via XCP on Ethernet. The following products from Vector support DoIP (Diagnostics communication over Internet Protocol). Compared to CAN, DoIP offers a significantly higher gross data rate and therefore the possibility to diagnose or reprogram multiple CAN, LIN, FlexRay and Ethernet ECUs in parallel. CANoe is one of the diagnostic testers in Vector's diagnostic tool chain. It offers reliable ECU diagnostics via DoIP in the laboratory and the vehicle. Therefore it supports DHCP and parameterization of a Gateway Logical Address (GLA) and IP address. In addition to CANalyzer, CANoe offers remaining bus simulation across networks and testing of ECUs and entire networks. CANalyzer is one of the diagnostic testers in Vector's diagnostic tool chain. It offers reliable ECU diagnostics via DoIP in the laboratory and the vehicle. Therefore it supports DHCP and parameterization of a Gateway Logical Address (GLA) and IP address. The focus of CANalyzer is analysis of the whole vehicle communication across network and protocol boundaries. The VN5610A and VN5640 are compact and very powerful interfaces connected to PCs by means of USB. They provide an easy and transparent access to the relevant physical layers 100BASE-TX and 100BASE-T1. The VN8810 is a compact and intelligent diagnostic hardware device for various applications involving vehicle diagnostics. Accessing the vehicle is easily done via the OBD socket. The reprogramming of ECUs and the execution of diagnostic scripts is handled by one single hardware device. The VN8810 operates thereby autonomously in standalone mode. Additionally the device serves as an access point for remote diagnostics. Vector offers numerous seminars and workshops dealing with Vector software tools, Vector standard software components, AUTOSAR and current bus technologies and protocols. The following regular training classes are held at the Vector office. It is also possible to arrange a training at your location and tailored for your specific requirements. This workshop teaches you the fundamentals of Ethernet- and IP-based communication in motor vehicles. You also get an overview of application-related protocols and their use cases. Furthermore you learn a lot about the functions of CANoe/CANalyzer .Ethernet for analyzing, simulating and testing Ethernet- and IP-based communication. In this hands-on training you will gain a fundamental knowledge about the connection of Ethernet and TCP/IP to the AUTOSAR Software architecture. We will take a detailed look at the most important Automotive use cases and you will learn about their general mode of operation as well as the according configuration principles in the AUTOSAR Software architecture. This workshop gives you a fundamental knowledge of Ethernet- and IP-based communication in motor vehicles, as well as a short overview of relevant protocols and their application areas. You will learn how to define and configure ethernet networks using PREEvision to derive an Ethernet communication description. Vector E-Trainings consist of several sessions which are spread over several weeks. The sessions build upon each other and comprise exercises and homework. The trainees are connected with the trainer by bidirectional audio-link, so questions can be posed and solutions discussed with the trainer. Course material and software can be downloaded. This E-Training addresses users of CANoe .Ethernet. The course is designed to provide an overview of CANoe .Ethernet’s basic features and an introduction to Automotive Ethernet. The only prerequisite to this E-Training module is a basic knowledge of CANoe features. In this E-Learning course you will learn the fundamentals of Ethernet- and IP-based communication in the automotive field. The E-Learning course is also suitable for customers participating in the Ethernet and IP Workshops and E-Trainings of the VectorAcademy. You can learn the basics of Ethernet- and IP-based communication prior to attending the workshop. In this way, entry into the workshop is made easier because some contents are repeated and covered in more depth during the training.